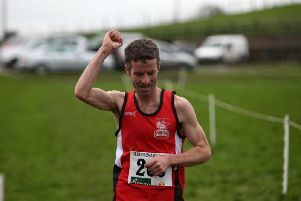 North West Cyclins Club's Nigel Bradley races to victory in the A4 Category of Sunday's 'Danny Boy Race' in Feeny. North West Cycling Club’s Nigel Bradley produced a superb performance to claim victory in the A4 category of Sunday’s Foe Valley C.C. promoted ‘Danny Boy Race’ in Feeny. The win continues Bradley’s successful run of top place finishes in his last three races and makes him the top points holder in his category in Ireland meaning the local rider will now be promoted to A3 status. Bradley struck for glory 50m from the finish line and out-sprinted French born Coleraine rider, Anton La Corre, of Causeway Cycle Club at the event which attracted more than 160 rider across its four races. The 50 mile A3 race was won by NRPT’s Marc Heany while the ladies race won by Catherine Smyth of Team Madigan. The N.W.C.C team go into next weekend’s Carn Classic road race in Maghera in buoyant form having secured victores at two of four early season races. (A3 Race) 1, Marc Heaney (NRPT-Magnet); 2, Conor McCann (Team ASEA); 3 Cameron McIntyre (NRPT-Magnet). (A4 Race) 1, Michael Bradley (North West); 2, Antoine Le Corre (Causeway); 3, David Gibson (Bann Wheelers). (Women’s Race) 1, Catherine Smyth (Team Madigan); 2, Clare O’Neill (Square Wheels); 3, Mairead McCrory (Carn Wheelers).